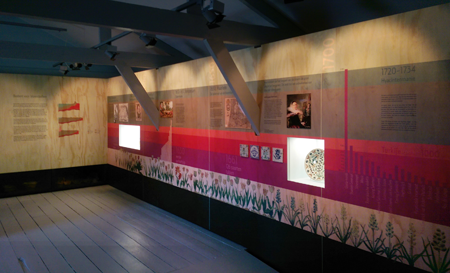 Museum De Zwarte Tulp in Lisse tells the story of the cultivation of flower bulbs – the beauty and the hardship of the trade. 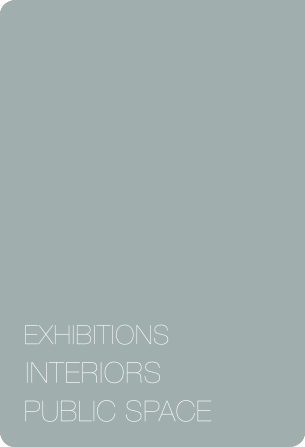 For this complex history spanning 5 centuries, Atelier Alkema and Studio OTW joined forces to create a new exhibition concept and give a new identity to the museum. The backbone of the permanent installation consist of three time lines – each following an aspect of the growth of the flower bulbs. 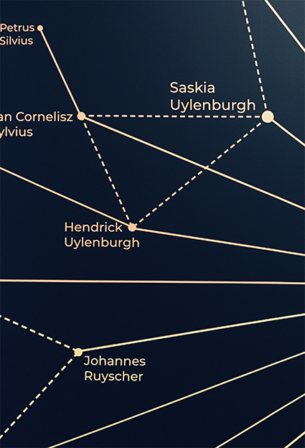 First, the five-century line illustrates the continuity of the fascination for the flower and the need to keep producing bulbs. Contrasting the continuity of the centuries, a yearly cycle of seasonal works tells of the hardship and labour necessary to produce the bulbs. Finally, the painstaking process of growing new cultivars is illustrated in the scientific, ten-year-long time line. 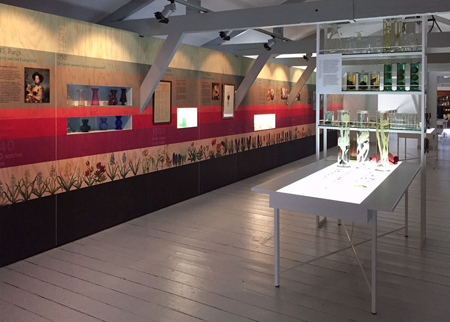 This approach allows for an intricate weave of information, dense display of the museum collection and an interactive zone where visitors are invited to take on the role of the breeders and eventually create their own new tulip in the interactive game Tulip Toy. 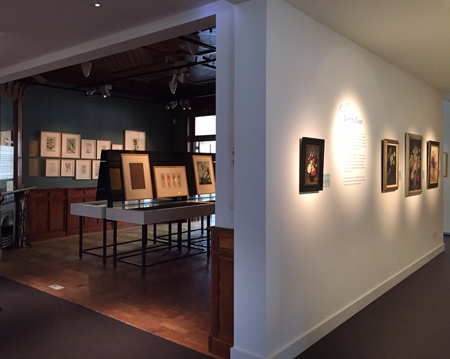 The visit continues on the ground floor where the beauty of flowers is omnipresent in the art collections on display. 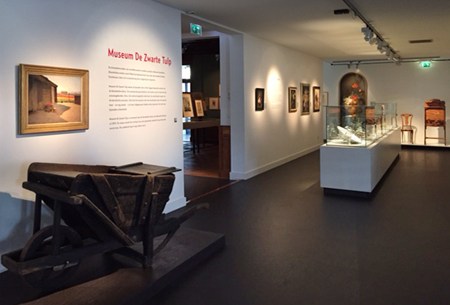 Collections Nieuwenhuis, De Witte Zwaan and the Wyler-Meyer are long-term loans on display in the museum. 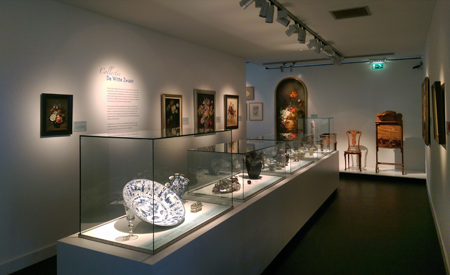 These collections, partially displayed in historic interiors, are presented in a context of an art cabinet. 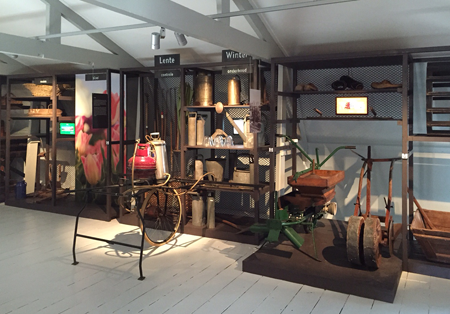 Museum shop, café and the education centre have been designed to complement the exhibitions. 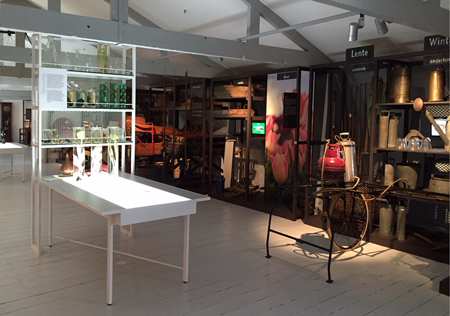 The ‘look and feel’ of the exhibition as well as the interior draws inspiration from the history of the building – a former barn used for storing and drying the flower bulbs. 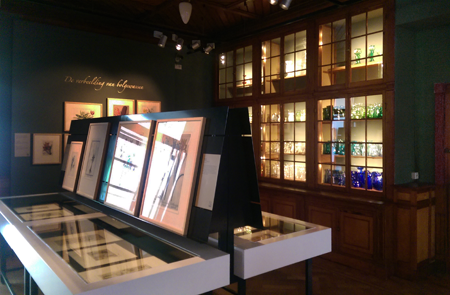 The design of cases and fixtures reflects on the simple detailing of the wooden tools in the collection. The basic pallet is neutral, while the colour accents are extracted from the bright floral fields.